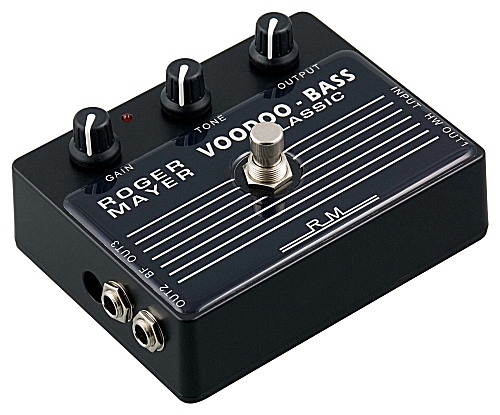 It is extremely popular for use with Bass Guitar where it is used to provide both distortion and compression without loosing any of the Bass Guitars original tone and retaining the rich low end. It has become the No.1 Bass Pedal in Japan where it is the norm for serious Hard Rock and Metal Bass Players who are rediscovering the joys of adding both compression and distortion to their sound. Electronically the Voodoo-Bass and Voodoo-1 each share all the same features but the equalisation sections have been altered to provide a completely different set of optimised tone response . It can also be used with regular guitars where the added gutsier bass equalisation enables players who favour single coil pickups to reproduce quite effortlessly the rounded, bluesy sound of classic pickups such as the Gibson P90. The comprehensive Gain and Tone variation provided by the Voodoo-Bass enable a very wide range of distortion sounds to be created from the compressed, just clipped sustain of traditional Chicago Blue to the sweet scream of full tube overload. Electronically the Voodoo-Bass shares all the same basic Voodoo Series features with dual output buffering or hard wire output etc. The distortion section uses a unique combination of the best discrete and IC design techniques to emulate the type of distortion found on many classic tube amplifiers. It allows the player to create a wide range of distortion effects from mild to extreme whilst reacting to the most subtle nuances in touch and playing. The Voodoo-Bass is housed in our Classic Style enclosure with both dual direct drive buffered outputs or hard wire output and has provision for an internal 9-Volt Battery (battery life 150Hrs) or can be powered from a 9-Volt DC Power Adapter (not supplied). Extensive internal filtering ensures that noise free operation is maintained even with the most basic of adapters. The Voodoo-Bass has a true hard wire output plus two buffered outputs that can drive long cable lengths with no high frequency loss. These buffered outputs are disconnected when the hard wire output is being used. This means that all performance situations are catered for whether you want a true hard wire output or your situation calls for the advantages of buffered outputs. This new reduction in footprint area together with the jack sockets in the conventional position makes the integration into pedal boards very efficient. For a futher reduction in footprint consider our new TC Version of our popular models. Width 95 x Depth 120x Height 57mm. Weight: 350g .